Stop us if you’ve heard this before: it rained during the High Point weekend. Oh, you need us to stop then? Well, we’ll keep going because technically Saturday and Sunday were rain free, but the damage was done on Thursday and Friday. The Racer Productions crew that produces the event elected to cancel Friday’s amateur practice day to preserve the track. On Saturday morning, some riders and teams thought the track should get disked, but the track crew did not, thinking instead that it would have just dug up the mud and covered the track in giant mud chunks, and there wouldn’t have been time between sessions to fix it beyond that. Injuries restricted the growth of Tyla Rattray a season ago. The Monster Energy/Pro Circuit Kawasaki rider was limited in his preparations for the jump to the 450 Class a season ago after fracturing his C7 vertebrae in supercross. The 2012 opener at Hangtown set the South African back again, as he missed the next four rounds with a broken hand after being struck by a rock. “Obviously it’s still new for me racing the 450,” Rattray said at the High Point post-race press conference. “I did a couple races last year, but setting up on the 450 with the new triple air fork [is different] and I think our engine was too strong.” With a revised setup, Rattray finally looked like the rider we used to know—the one who won High Point in the 250 Class a few years back. Rattray scored his first career 450 overall podium at High Point. Rattray’s Monster Energy/Pro Circuit Kawasaki teammate Darryn Durham didn’t have the storybook ending he would have liked in his return to High Point. Returning to his home track for the first time since 2011, the Butler, PA, native was in the mix in the first moto before eventually finishing eighth. Things came unraveled in the second moto when a busted radiator ended his race. “I’m really bummed on how it ended, I love racing here and I just wanted to good finish in front of all my family and friends,” Durham said in a team press release. He did tell us, though, that he’s feeling better each week after his leg injury from Hangtown, and hopes to finally be back to 100 percent for Budds Creek. The pieces of the puzzle are finally fitting together for N-Fab TiLUBE Yamaha’s Phil Nicoletti. The surprise of the 450 Class continued his torrid start to the season at High Point. Following his second top ten in the last three motos in moto 1, Nicoletti went down off the start of moto two when BTOSports.com KTM’s Andrew Short bike malfunctioned. “I had a great first moto and felt like I could easily repeat the same result in moto 2,” Nicoletti said in a team press release. “I started well and was looking good and then Short’s bike died. I had to make a move so I wouldn’t hit him and unfortunately I went down.” Nicoletti worked his way through the pack to salvage fourteenth in the moto and eleventh overall. Nicoletti wasn’t the only victim of Short’s bike malfunctioning on the start of the second moto. The crash also claimed Short’s BTOSport.com KTM teammate Michael Byrne. The Australian was only able to work his way back to 25th in the moto. It was a tough weekend overall for Byrne, who is still trying to come back from breaking his leg last season. The Aussie only carded the 37th fastest time in 450 practice, and only the top 36 get in, so Byrner was off to the LCQ race to try to get a top four. He finished second to qualify for the motos. The winner of that 450 LCQ? Darryn Durham’s brother, Shane, who typically only rides a couple Nationals a year—with one being his hometown race at High Point. The younger Durham had bike problems in the first moto and was a scratch for the second. Nico Izzi is out for the seasona after tearing his ACL at High Point. Attack of the air forks! Yoshimura Suzuki’s James Stewart was sporting the new Showa triple-air pneumatic spring forks for the first time this year (Stewart had been running the coil-spring fork at the first three rounds). Some testing at his home in Florida led to the switch. Ryan Villopoto, of course, has been using the same fork to great success so far this year. Blake Baggett explained to us before the race that he still isn’t able to do 30-minute motos during the week due to his bad right wrist. Most of his riding is reduced to just testing time, where he does a few laps and then pulls in to try new stuff. After another supercross season lost to injuries, Josh Grant is proving his merit outdoors. The book on Grant has always surrounded his natural speed, but injuries have disrupted much of his career. Grant is healthy again and showing the speed to be a top five contender. On the heels on a season-best fifth in the first moto, Grant snagged the holeshot in moto 2 and battled with Ryan Dungey early. Grant later crashed and twisted his ankle, but managed to fight back to eighth for eighth overall on the day. Rockstar Energy Racing’s Nico Izzi re-aggravated the same knee he had operated on late in 2012 to repair a torn ACL. After qualifying an third in practice one at High Point, Nico caught his toe in a rut around a very fast corner, twisting his leg in the second qualifying session. After an MRI on Tuesday, the team confirmed that his ACL is again torn and he will be forced to sit out the remainder of the season. Wasn’t a good weekend altogether for the Rockstar squad in the 250 Class. Team Manager Dave Gowland says Blake Wharton has been suffering from arm pump, Izzi is now injured again, and Jason Anderson got taken out by Zach Osborne in the first moto, and had a bad start in moto two. At least Ryan Sipes saved the day in the 450 Class with solid 6-6 moto scores. Joey Savatgy had a career best finish in the second moto. KTM’s move to keep rookie Joey Savatgy on-board after the collapse of J-Star/JDR KTM continues to pay dividends. 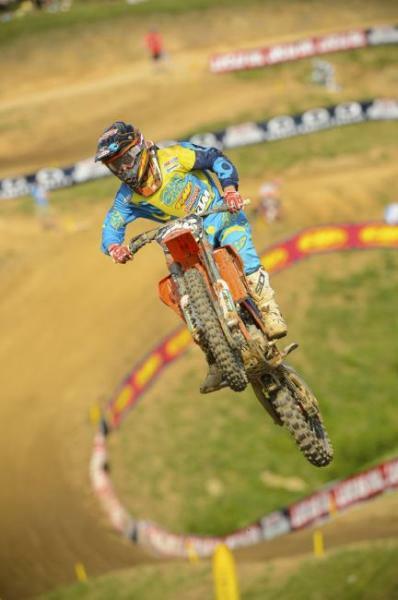 Although Savatgy was born in California he spent his amateur days in Georgia at the highly respected MTF Academy. His familiarity with High Point—where he raced a Loretta Lynn Area Qualifier in 2012—paid off as Savatgy finished a career-high fifth overall in the second moto. After qualifying twelfth fastest in the first practice session, privateer Fredrik Noren cased a jump in the second session and broke his triple clamps. With the fastest times coming in the second session, his first session would not hold up sending him to the LCQ. While running in fourth, Noren crashed and missed out on the main. After the race he said he was disappointed because he was riding well, but that he is looking forward to Budds Creek and getting inside the top 15 overall. 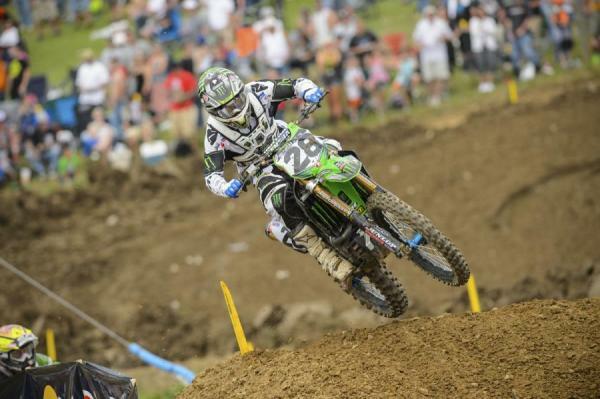 The 2013 250SX East Region was pivotal for privateer AJ Catanzaro. He stole headlines with a fourth in Indianapolis en route to a top ten overall finish in points. Catanzaro made his 2013 Lucas Oil Pro Motocross debut this weekend at High Point in the 450 Class, capturing 20th overall via 28-18 moto scores. Maykers/Witt Ends Racing’s Zack Freeberg returned at High Point after missing the first three rounds with a cracked tibia suffered in supercross. Freeberg had bike problems in the first moto and finished the day with 40-37 moto scores. Privateer Mitchell Oldenburg made his Lucas Oil Pro Motocross debut a week ago at the Built Ford Tough Tennessee National. After failing to score points in his debut, Oldenburg garnered his first career points at High Point with a 19th in moto 1. Jacob Hayes, who made his 2013 debut in Tennessee as well, scored his first career points in the 450 Class with a 20th in the second moto.